We would like to present you with a suitable technology for the efficient soldering process of our connection technology. Therefore we have developed and implemented a very interesting solution. 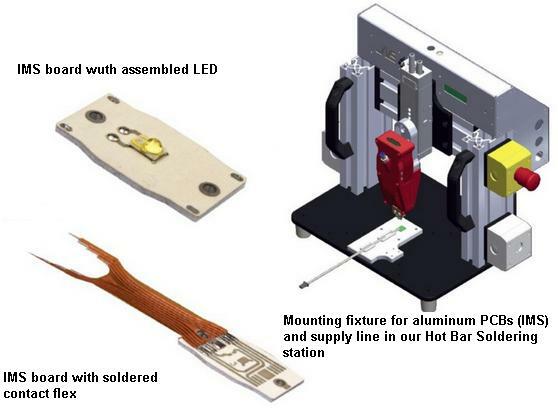 The Hot Bar Soldering process connects different connection parts with each other. Due to the fact that the contact pads are often soldered to a PCB it is important that the materials used offer a slightly different alloy, in which reliable solder points can be created. Before the soldering process one of the two solder points is coated with flux and then the connector part is pressed onto this point by the still cold thermode. Subsequently a brief heating of the thermode is performed until the melting temperature is reached. The system is cooled down very fast after the soldering has taken place. Air is almost always used for the cooling. 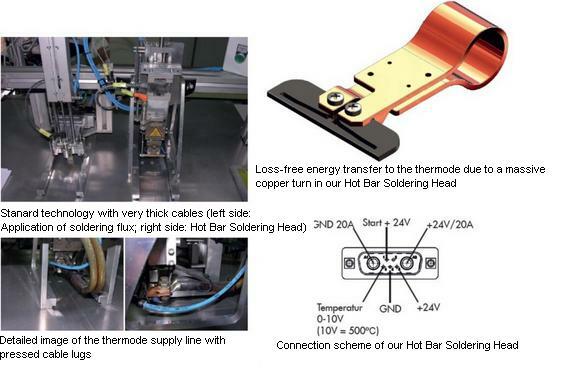 Although Hot Bar Soldering is a single solder process multiple solder connections are almost always produced. Another great advantage is the mechanical fixation of the solderable part by the thermode before the soldering process starts. As a result both parts can perfectly be applied to the appropriate position. Currents between 150 and 300 Ampere are used to heat the thermode. In classical systems the current is generated by a transformer. Due to thick supply cables (thumb's width) leading the current to the thermode these systems are nearly immobilized. 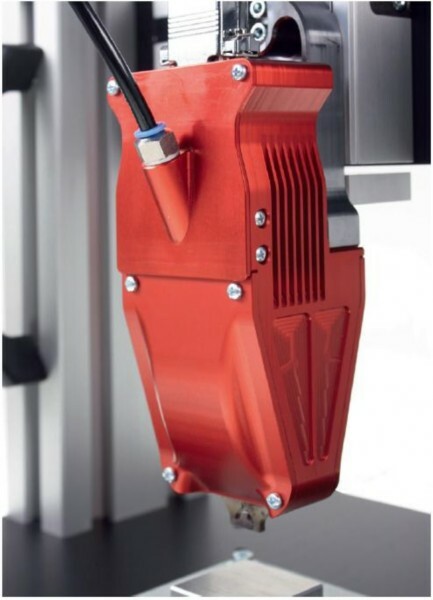 They only move a few millimeters in the direction of the stroke which is sufficient to cause cable breaks - especially at the thermode connection – in a 24/7 operation. We also use currents up to 300 Ampere in the thermode, but in our approach the thermode is placed directly behind the power electronics which converts the input current of circa 15 Ampere (input voltage 24V) up to 300 Ampere. The 24 Volt supply line is thin in comparison to the supply lines of conventional systems. Additionally the whole system is packed in an aesthetic designer housing. We also offer the suitable connecting elements to maintain sufficient high current flow. We present the heart of our system, the Hot Bar Soldering Generator BLG-300. Its design is unique and it is only exceeded by its function. Usually the thermodes are made of stainless steel, but also other materials, e.g. 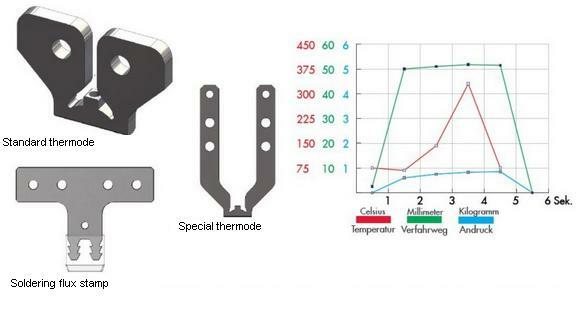 Wolfram is possible We deliver a broad range of different widths and we often adapt the thermodes individually to the customers soldering requirements. 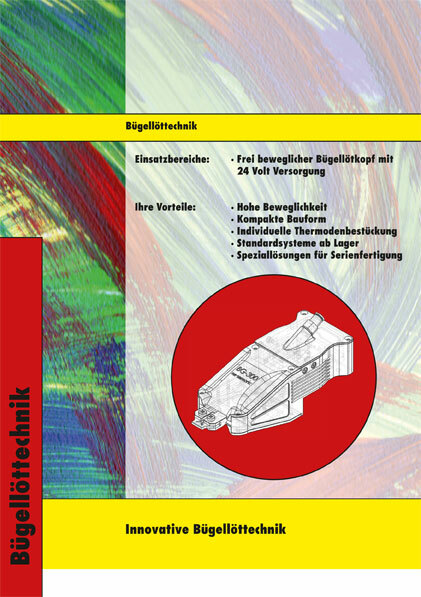 Due to a special thermode profile we achieve an extremely homogeneous heating. Integrated in the thermode there is a temperature sensor positioned in a way to produce as close as possible measurement results. Due to the complete pluggable connections the change of the thermode is so simple that you need about 1 minute. 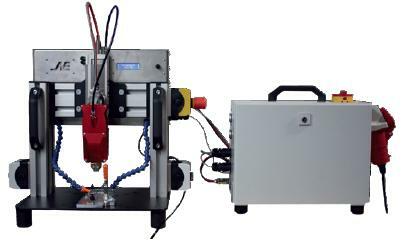 For series production we recommend buying two Hot Bar Soldering Generators to change the thermode without time-related stress and or production interruption. Due to our special generator technique leading to a higher power of the Soldering Bar at the thermode and the compatible control electronics we provide a fast, high-performance system. Subsequently we chart a working cycle diagram as it is used to solder flex strips to a PCB. Depending on the application the cycle times can vary in time. By performing in house experiments and continuous parameter adjustment the optimal cycle times are achieved. In many cases our systems work in three eight-hour shifts where a split second is crucial. 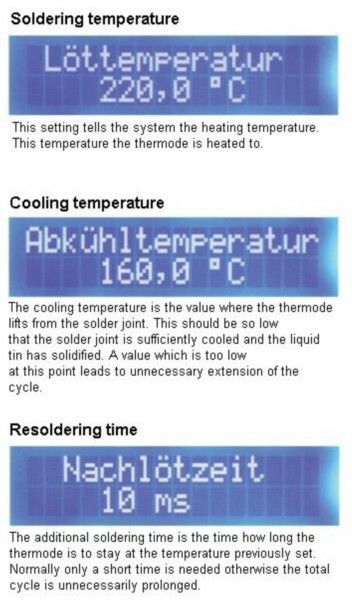 Thereby, it is important to choose the cool down time – the time for cooling the solder bar before it is lifted up from the soldering point. 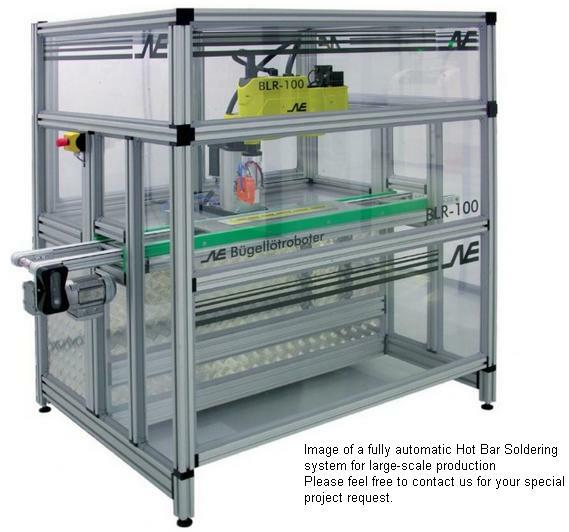 Our Hot Bar Soldering system BLS-50 is a complete system for direct use in the ongoing production. 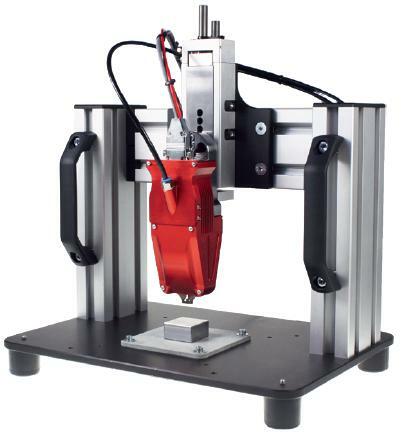 The Hot Bar Soldering station is based on a universal mounting in the base plate where various equipment can be applied. We can also construct and produce the suitable mounting setup. In its simplest form you send us the parts which are to be soldered and we construct the compatible mounting plate for you. 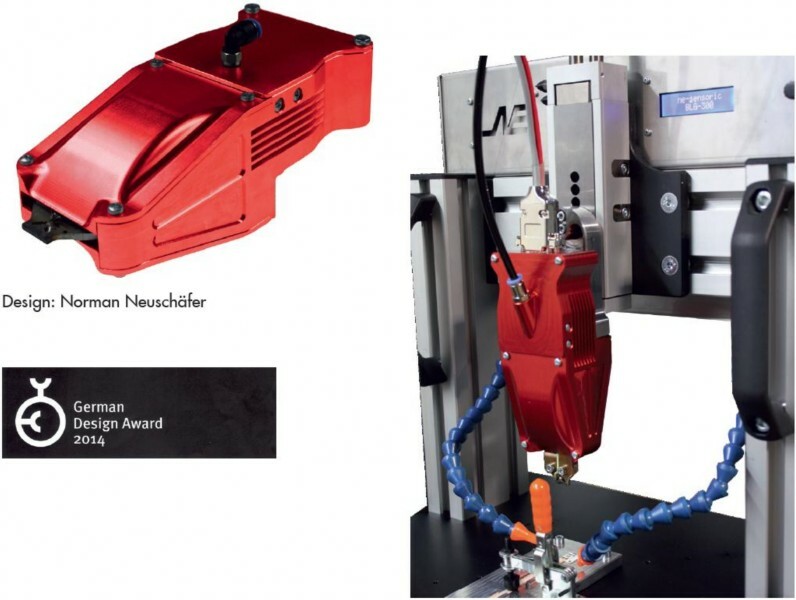 In our affiliated company, NE-Sensoric GmbH & Co. KG, we build production lines matching perfectly to our Hot Bar Soldering system. Again, the focus is always on a universal possible application. The modular construction shortens the production and delivery time. 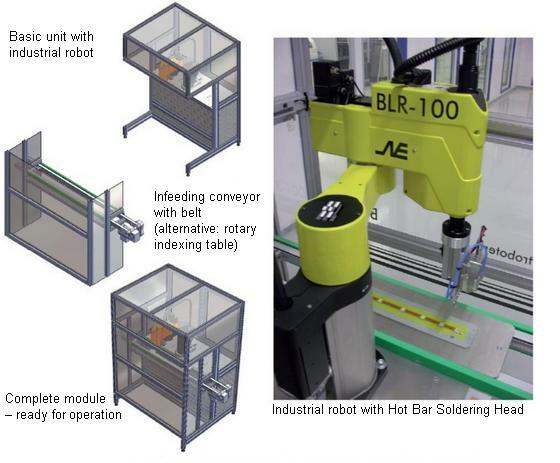 By the use of industrial robots the Hot Bar Soldering system is able to solve nearly every soldering task. Soldering in angular positions, offset rows as well as different positions are no problem for our system. If you want to change the thermode we recommend that you replace the complete solder head since time required is less than a minute. Such a system allows the customization to every new production situation in your company.